Which massage should I book? Pressure can be very firm, but this isn’t necessary for some of the most effective techniques. Full body work, with perhaps a bit of extra focus in one spot. Learn more about all of our massage therapies, watch videos of our services, and book your massage online at www.EVDaySpa.com! By now I’m sure you’ve seen or read about those circle-like marks on the Olympic swimmers and gymnasts. They are caused by a treatment called “Cupping” that is an effective way to ease muscle tension, boost circulation, and reduce fascial adhesions. Cupping can be done in a variety of ways from a manually pumping vacuum cups, by heating glass jars (fire cupping), and with silicone cups that we use at East Village Spa. Michael Phelps posted a photo of his cupping therapy on his Instagram account. 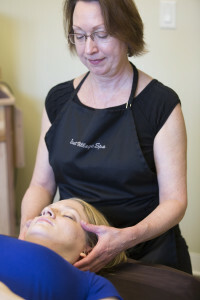 At East Village Spa, many of our licensed massage therapists are trained to use silicone cups in a session. This addition to your therapy is especially beneficial in helping to break up muscle or fascia adhesions, scar tissue, and increase circulation to an area. Cupping is great for lymphatic drainage and helping treat areas that are difficult to stretch, like the IT Band. Instead of pushing into the tissue, the cups lift the tissue. Cupping does not always lead to the circular marks everyone is talking about at the Olympics. These are caused when cups are left in one place for a long period of time. In the cupping sessions we do at East Village Spa, we typically leave cups a shorter period of time in one spot, or are moving them over an area to help lift the tissue. This therapy is combined with hands-on modalities like deep tissue, myofascial, or trigger point release. If you are interested in booking a massage session that includes cupping therapy along with traditional massage, call (515) 309-2904 and ask to schedule a massage with one of our therapists with experience in cupping. We know that there are many benefits to our services and the products people can use at home for self care, but sometimes it is possible to get too much of a good thing! Here are a few times when it is best to ease up during a treatment or during self care at home. Foam rollers are great for relieving aches and pains, for myofascial release, and stretching but sometimes people over-do it and can cause injury or tissue damage for excessive or overly aggressive foam rolling. If foam rolling hurts, you might be bruising or causing tissue inflammation. Check with your chiropractor, a trusted massage therapist, experienced trainer, or physical therapist for tips. Who doesn’t love the smooth feeling of their skin after a good facial exfoliation? Once or twice a week is the perfect amount to exfoliate, but if you do any more than that, your skin can become dry, irritated, and overly sensitive. Ask an esthetician if you aren’t sure whether you are exfoliating the right amount or with the right consistency product. A bit of “good hurt” is helpful, but massage pressure that causes pain, makes you tense up, or grit your teeth is counterproductive and can actually bruise your tissue and create inflammation. The ideal working pressure for your body to actually create lasting change (at least when dealing with trigger points) is about a 6-7 out of 10 on the pain scale. More than that and the body tenses up to defend against the pain, causing even more tightness, potentially bruising and injury. In most cases, if you are told by a therapist that massage has to “hurt to work” or if you experience soreness that lasts for more than a day after a massage, you might need to try a different therapist or treatment style. Please, don’t go into a massage and issue your therapist a challenge stating “Bet you can’t hurt me!” because we do not WANT to hurt you and we’d rather give you a great massage than spend 20 minutes explaining why we shouldn’t just pummel you with an elbow. Essential oils are a great way to help ease stress, boost focus, and relax sore muscles but they should be used with caution and by following the instructions. Essential oils should not be used “neat” or directly on the skin without being mixed into a carrier oil or cream. Some oils can cause irritation, over-exposure to oils can cause side effects (any of us who have made too many blends and bath products at home in a sitting can attest to the headaches, insomnia, or other side-effects we’ve experienced from over-exposure), and some oils are not safe for all health concerns. The National Association for Holistic Aromatherapy has some great safety info on their site.